Mt. 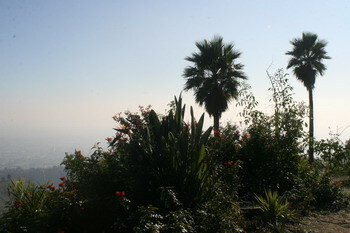 Hollywood (1,640 feet) is the highest point in Griffith Park. So why not start the New Year with a hike up there? Up the Aberdeen Trail, along the Hogback Trail, over the bridge, past Dante’s View, up to the peak, down again, over to the Observatory and back to the car by way of the East Observatory Trail. 3 1/2 hours. Done. In clear weather the view from Mt. Hollywood is quite something, offering a 360-degree view over the city, the mountains, the San Fernando Valley and the ocean. Alas, even though the weather was perfect for hiking, sunny and warm, but not too hot, there was also a slight haze. So no spectacular view. Well, maybe next time. Spectacular on a different scale is Dante’s View, a terraced garden on the way up to the peak. The garden was created in 1964 by an Italian immigrant and burned down in the fire of May 2007. There was nothing left, the flames had devoured every single plant, it was complete devastation, nothing but ashes and some blackened tree stumps. Clearing, landscaping and replanting at the site started almost immediately and the garden was restored to its former glory. With the surrounding mountain slopes still bare and brown after the fire, the garden is even more than ever like a small paradise, inviting to people and animals. The only difference is: People go there to rest and to drink in the beauty of their surroundings. 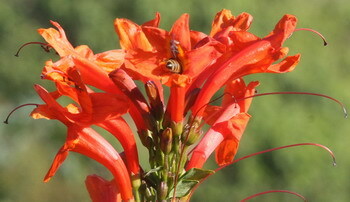 Animals (bees and hummingbirds) go there to work and to drink nectar. Ah, palm trees, my true love. It got so cold out there, my son had to go buy a blanket! Yes, it was nippy here at night. Quite, quite so. We already have had the winter duvet out for quite some time, which goes on top of the summer duvet. I actually prefer sleeping toasty warm under two duvets to having the heating running all night. But under just one blanket I would freeze! Well, he’s so warm natured, I was flabbergasted that he needed more than the flannel sheet blanket he took out there with him. He did buy a plush blanket, so I’m assuming it’s really warm.